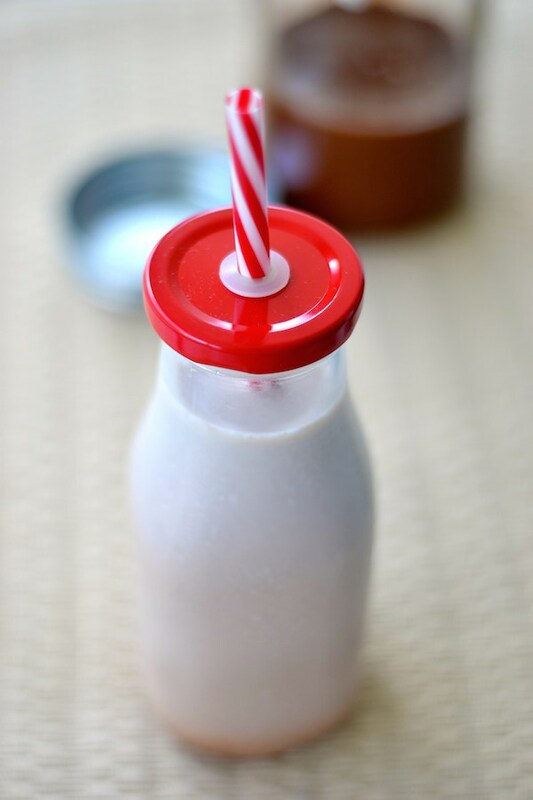 Make Your Own Healthy Chocolate Milk and stop worrying about GMOs, artificial ingredients, and refined sugars. Yes, a healthy and homemade chocolate syrup that is so easy to make. The perfect treat for kids and adults. There is nothing better than homemade recipes made with high quality ingredients. Real ingredients will make your chocolate milk taste so GOOD! Oh chocolate milk. A cold glass of chocolate milk is just delicious. But what about finding a healthy chocolate syrup or powder? This has been one of my biggest concerns lately. My 7 year old wants chocolate milk. My 2 year old wants everything his big brother wants. How can I find a healthy solution? Make Your Own Healthy Real Chocolate Milk recipe is the answer! When I was pregnant with my first child I used to say I will never give my kids chocolate milk. Why add unnecessary calories, tons of artificial ingredients, and most importantly sugar in their diets? Once you are a mother and have to deal with reality, you are going to have to compromise. Let’s talk about chocolate milk. You decide not to give it to your kid. Eventually that kid goes to preschool and tries it there, or at a friend’s house, or even at a party. It is inevitable. The kid is going to try chocolate milk, and the kid is going to love it. Once they know milk can turn into chocolate, they are going to ask for it. Reads in bold letters, the last line on the right: Produced With Genetic Engineering. I thought to myself: Why am I buying organic milk if I am adding GMOs to it? It doesn’t make any sense at all. I really needed to come up with the Make Your Own Healthy Chocolate Milk recipe. 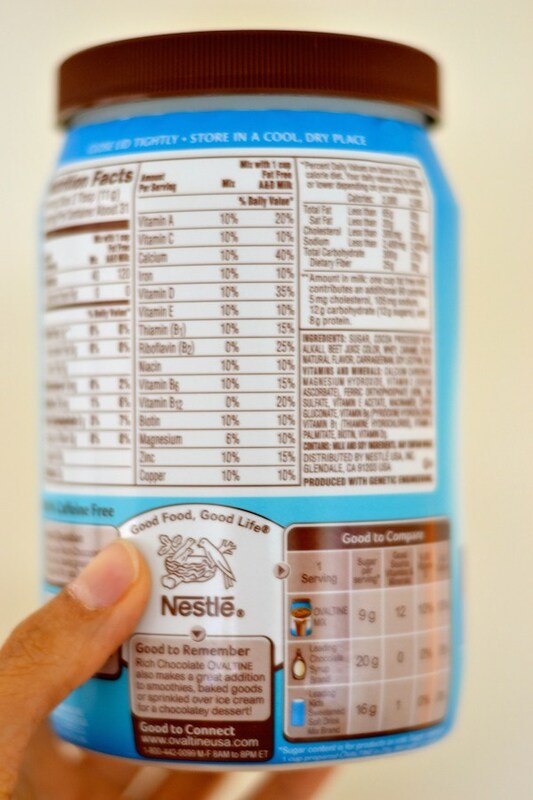 Popular brands like Nesquik and Milo are also produced with genetic engineering. At least they are being honest and disclosing it. The problem is many people don’t read labels. See the laundry list of ingredients, vitamins, and minerals? They are all artificial. If you want more information on vitamins, please see Vitamin C Gummies. Give your kids a good natural multivitamin , and feed them nutritious foods. The best way their bodies absorb nutrients is eating real food. Most of them contain less than 2% cocoa making them not even real chocolate. I definitely don’t want to give this to my kids! No real ingredients with no nutritional value. Disaster! If you absolutely have to buy a store-bought syrup I will go for Ahlaska Organic Chocolate Syrup . From all the brands I think it has the cleanest list of ingredients, tastes good, and it is organic. But don’t worry. Here’s my Make Your Own Healthy Chocolate Milk recipe to the rescue. 2 simple “real” and nutritious ingredients: Organic Cacao Powder and Organic Maple Syrup . Want to know more amazing benefits of cacao and why I used it in this recipe? Please see my Cacao Vs. Cocoa What You Need To Know post. Now my kid’s chocolate milk is packed with antioxidants, real vitamins and minerals. Awesome! You can’t simply mix cacao powder and maple syrup in cold milk because it won’t dissolve. So you need to make your syrup first. Don’t worry, it is super easy and won’t take long. Store your natural chocolate syrup in the fridge while it lasts. Just add a couple of teaspoons to a glass of milk whenever you want your delicious chocolate milk. Voila! You have healthy chocolate milk for everyone to enjoy. It tastes way better than any chocolate syrup I have ever tried. The best part is I got rid of an unhealthy product and found a healthy way to keep my kids happy. 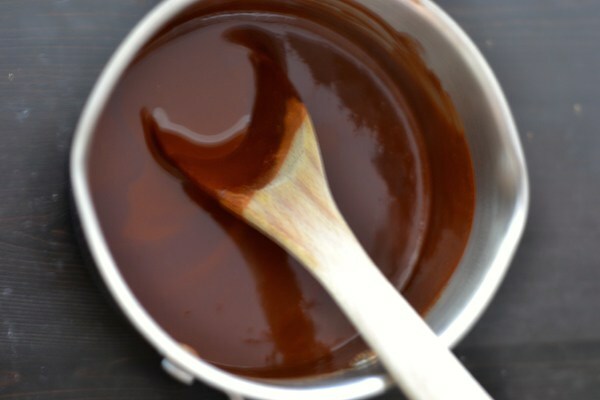 Homemade chocolate syrup using only 2 healthy ingredients. 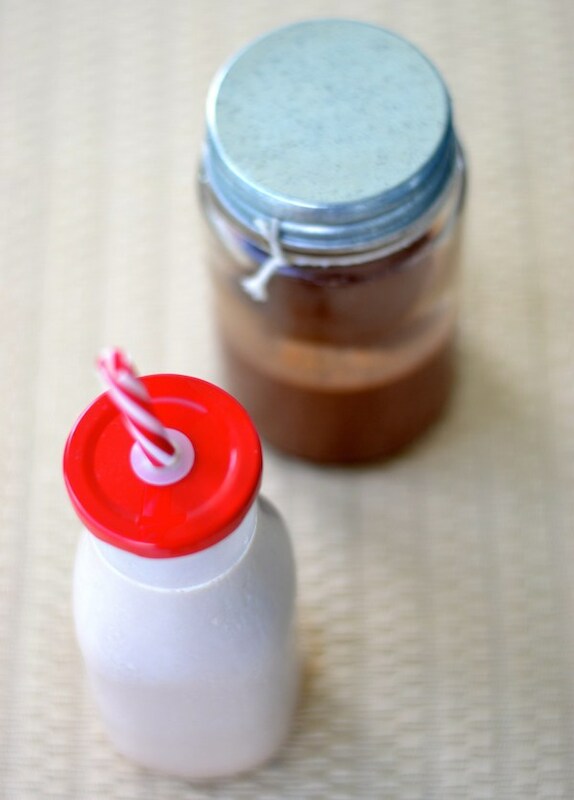 Great for making your own healthy chocolate milk. In a small saucepan, place water and cacao powder in medium-high heat and mix well. Once mixed, add the maple syrup, mix everything well and bring to a boil. Turn down heat to medium/low, and stir for a couple of minutes to thicken the syrup a little. Store in a jar or any container in the refrigerator. 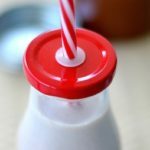 Add a couple of teaspoons(depending on your taste) to a glass of milk (dairy or non-dairy) to make your chocolate milk. Mix well. Will last refrigerated for about 7-10 days. This post contains affiliate links. The products linked are the products I used for this recipe. If you purchase a product through an affiliate link, your cost will be the same but Creative Healthy Family will automatically receive a small commission. Your support is greatly appreciated. Hi! I just made your recipe for myself, an adult who loves chocolate milk now and then but doesn’t care for additives and junk that is in store bought chocolate milk. I just wanted to say thank you for such a clean, easy, and delicious recipe. I really like it! These chocolates are really delicious! I need to make some soon! I keep them in the freezer for about a week. Hope this helps! Thanks so much! I recently jumped on the non-GMO bandwagon, and it is really a royal pain trying to find any “prepared” foods that are clearly labeled as such. I will definitely try your recipe, as I am a chocolate milk nut! Thanks again! Glad to know you enjoyed the recipe. We try to avoid GMOs as much as possible! Hey, this was super simple and delicious. The maple syrup adds a nice side flavor and it’s not too sweet; you can definitely taste the chocolate. I can’t believe how easy it was! I actually thought it tasted better than my ovaltine mix which I’ve been trying to escape from. As an adult I love it. But it definitely is less sweet than the store-bought mixes (which is good), but I wonder if kids who are used to the sweeter flavors may not be crazy about it to begin with. 5 stars for excellent taste and super easy to put together, it literally took me less than 10 min and the jar should last me a couple weeks. Hello. I am all out of maple syrup. Do you think agave would be a good substitute? I haven’t tried it with agave but I am sure it will work just fine. Hello, would this work with agave ? I ran out of maple syrup. I appreciate your help! How long does the natural chocolate syrup last in the fridge? I keep it in the fridge for about 10 days. This was so easy and fast to make, I think it took literally 5 minutes to whip up and it’s so delicious, it definitely staved off my chocolate craving! Happy to know you liked the recipe. We love it too! Thank you so very much for this recipe. I have been wanting to quit the Quik habit, and now am able to! Just wondering if you have tried to can this so as to have it on hand for a longer period of time because of ability to preserve quantity? Also, if it does well being canned, would be great for gift giving. I am currently making a single recipe at at time. I am also thankful for the chocolate recipe with 3 ingredients! I used it Sunday to make chocolate covered pretzels, and my husband loved them! He ate most of them! My favorite thing is Chocolate pretzels and Coca Cola! I have not tried this with the soda yet…looking for a great opportunity, and also a very infrequent one. Hi, thank you so much for your comment. I love the chocolate covered pretzels idea! I am going to try it soon 🙂 No, unfortunately I haven’t tried to can this recipe. But when I make it, I keep it in a closed container in the refrigerator for about a week with no problems. Hope this helps.